It is that time of the year when everybody, who is anybody in the capital market, starts making annual prediction as to what lies ahead for us in the year 2013. But, the fact is that predicting the markets (for 2013) is challenging, to say the least. 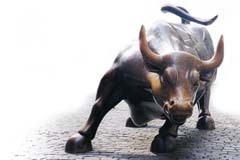 However, one thing seems distinctly possible for our markets – we should start on a strong footing and hopefully make an attempt to scale the November 2010 high (NIFTY- 6312, Sensex- 21005) in the first quarter itself. Although it is challenge to predict future Nirmal Bang Securities has tried to identify 15 scrips (5 among large-caps and 10 belonging to the mid-cap space) for investment in 2013. High focus on exports, new launches going forward, diversified product profile should help Bajaj Auto perform relatively well in the domestic 2-w (2-wheeler) segment, where Honda Motors is growing at the cost of ‘India-focused’ players. The company’s focus on doubling exports by FY’16E (currently contributing 35 per cent to net sales), leadership status in certain key segments in geographies like Egypt, new model launches in the near-term should help the company navigate through the present slowdown in the automobile segment. It’s a classic play on the robust growth of the exchanges in the country. The company’s 26 per cent stake in MCX should also reap rich returns for the investors considering the superior technology platform, robust initial response in the form of new members. HDFC Bank could very well be regarded as the best managed bank in the country. The premium valuations very well justifies the consistency which it has been reporting over for quite some years now. The Bank has grown its net profit consistently at a CAGR of +30% over the last several years. More commendable is the fact that this growth has been achieved along with consistent improvement in asset quality. The Bank’s loan book is equally divided between the retail and the corporate segments. In the corporate segment, HDFC Bank finances mostly working capital loans in case of corporates. The Bank has a strong liability franchisee with CASA ratio quoting at 45.9 per cent of the total deposits. A high CASA ratio leading to effectively lower cost of funds has helped the Bank clock the highest NIMs (next only to Kotak Bank) in the banking space. We feel that the best for HDFC Bank is yet to come. As mentioned in the outlook for the market above, we expect significant buoyancy in the markets during the initial part of the calendar year. Post this, the market is expected to take cues from the economic growth parameters. To safeguard the portfolio in case of significant declines, if any, during the later part of the year, we have chosen Lupin from the pharma sector. In H1FY’13, the company posted a net profit of Rs.570 crore (an increase of 20 per cent) on net sales of Rs.4458.4 crore (an increase of 35.7 per cent y-o-y). The company has seen a few launches in the US market over the last couple of months and we expect them to start contributing from Q3FY’13 onwards. We expect an improvement in overall margins on the back of pick-up in the US business and stable growth from India and rest of the world. We believe Apollo Tyres is the only Indian company capable of emerging as a global-tyre manufacturer (presently exports to about 115 countries across the globe). The prices of key input in the tyre industry – natural rubber – has corrected between 16-18 per cent over the last one year. This, should lead to an improvement in operating profit margins considering the fact that raw material prices (of which, natural rubber is a major component) stood at 63 per cent of net sales in FY’12. We agree to the fact that there is weakness in the overall automobile OEM sales but as far as the replacement market is concerned, the same is expected to compensate for the same to a large extent. After touching a high of more than Rs.130 in November 2010, the share price of Delta Corp has retraced back significantly. Over the last 12 months, the share has consolidated in the range of Rs.55 and Rs.87. We believe that the share price would take cues from the numbers which the company is going to report going forward. Considering the four major developments taking place in terms of setting up a hotel and a floatel (floating hotel) in Goa, gaming facility at Daman and a new vessel at Goa(Horseshoe), we expect an exponential growth in the earnings from FY’14E onwards. In short, Delta Corp is a company where the numbers can only keep on improving every passing year because of ‘consumption’ play. Hi-Tech Gears Limited manufactures automotive gears and shafts at Bhiwadi, Rajasthan, mainly for 2- wheelers like Hero Honda, Escorts, among others. The company has an in-house forging unit and derives close to 20 per cent of its revenues from exports. The company has set up another plant near its mother plant for manufacturing of transmission auto components for CVs and passenger vehicles. The company posted an EPS of Rs.22.4 in FY’12 compared to Rs.18.7 during the previous year. The company has a policy of distributing more than 20 per cent of the earnings in the form of dividends. The results for H1FY’13 were weak on the back of the present fortune of the industry. We believe that the suppressed valuations of the share price have factored all the negatives associated with the sector as well as the company. A consumer durables company available at attractive valuations, The company is the leader in the top-door washing machine segment and being the first entrant in the dish-washers segment should augur well for the company, going forward. IFB Industries has a clean Balance Sheet with net cash and cash equivalent totaling up to Rs.88.1 crore, equivalent to more than 20 per cent of the present market-cap of the company. With the rupee showing signs of stability, consumer durable companies like IFB Industries, being net importers, should be benefitted. This, coupled with reduction in interest rates by 100-150 bps should augur well for the sector as a whole, IFB Industries included. We expect the buoyancy in cement segment to continue in this calendar year also. With major cement stocks outperforming the broader indices, the upside potential in large cap stocks appears limited. Despite the fact that India Cements is not in the best shape and does not have the best of profitability and RoE, we believe that the present share price underperformance captures all these negatives. Management’s efforts to ramp up the captive power generation (from the present 50MW to 100MW) making the company self-reliant in power, coupled with efforts to ramp up mining should reduce the overall cost structure for the company. The company’s improved operating performance on the back of these measures should result in significant growth in profitability going forward. At the present price, the stock has a decent dividend-yield of ~3 per cent. Under the able leadership of Mr. Romesh Sobti and his team, the Bank has grown its net profit 10-fold over the last four years from Rs.80 crore in FY’08 to Rs.810 crore in FY’12. This growth has come despite two bad years for the global economy. The asset quality of the Bank continues to be robust. With high focus on the consumer lending sector on the asset side and improvement in liability franchisee (scaling up the CASA from the present ~28 per cent to 34 per cent over the next two years, already moved from ~14 per cent in FY’08) should help improve the profitability of the Bank. One of the best managed quasi-PSU banks, Jammu & Kashmir Bank is a play on the economy of the state of Jammu & Kashmir. The Bank has posted strong growth in Net Interest income and expect the PAT to grow in a similar fashion. This growth has come when the asset quality is robust with gross NPAs at 0.2 per cent and Provision Coverage Ratio( PCR) at more than 90 per cent. The Bank is dominant in the state with one out of every two individuals having an account with the Bank. As far as the loan book goes, the Bank derives significantly high margins (in excess of 5 per cent in the state of J&K) and stable margins outside the state. During H1FY’13, Jammu & Kashmir Bank posted Net Interest Income of Rs.1089 crore compared to Rs.871 crore, an increase of 25 per cent y-o-y. The Bank registered a pre-provisioning profit of Rs.837.8 crore compared to Rs.629.1 crore, an increase of 33.2 per cent y-o-y. Profit after tax for H1FY’13 stood at Rs.515.6 crore. EPS for the half-year stood at Rs.106.4. Considering the improving prospects, consistent growth in earnings, we expect a strong re-rating to terms of valuation. With major corporate houses geared up to set up Banks/convert existing NBFCs into Banks, we expect value unlocking in a number of banks, mainly old private sector banks in the country. These banks have a long legacy and do not have a single identifiable promoter group. Karnataka Bank clearly stands out in the lot with a book value of Rs.137.9 and EPS of Rs.13.1 in FY’12. The Bank, with a decent asset quality, is available at attractive valuations. During H1FY’13, the Bank reported an Interest Income of Rs.1838.3 crore, an increase of 27.3 per cent y-o-y. PAT for H1FY’13 stood at Rs.200.6 crore, an increase of 120.8 per cent y-o-y. MRF Limited is the only company (with a consistent track record) in the history of Indian stock markets which has never announced a bonus/stock-split. Considering the small equity (Rs.4.2 crore compared to reserves of Rs.2556.6 crore), decent management and leadership status in the domestic market (~25 per cent market share), we expect MRF Limited to perform well going forward on the back of an expected pick-up in the OEM segment (on the back of interest rate cuts) and fall in natural rubber prices. present levels considering a turnover of Rs.2000 crore and a PAT of Rs.228 crore, translating into an EPS of Rs.37.9 in FY’13. During H1FY’13, the company has clocked a turnover of Rs.969.7 crore and a PAT of Rs.100 crore. The net cash and cash equivalent in the company’s books as on September 30, 2012 stood at Rs.35+ per share per share (~15% of the present price). The stock has a decent dividend yield of approximately ~3.5%. NIIT Technologies has had an excellent dividend payment track record. The dividend ratio for FY’12 stood at 80 per cent and payout ratio stood in excess of 25 per cent over the last five years. We expect this payout policy to continue in future also. Inspite of the velocity in the decision-making process slowing down, we expect NIIT Technologies to post growth every quarter not only on a y-o-y basis but also on a q-o-q basis. The Travel and Tourism segment, which now accounts for more than 40 per cent of the revenues, should help the company mitigate the impact of slowdown in the BFSI segment. It’s a high-conviction stock idea considering the fact that hopefully the company’s core focus on research should start paying off with the company filing wrap matrix formulation of Levetiracetamcin in the US in Q1FY’13. This, in our opinion, should be a turning point as far as the financial performance of SPARC is concerned. The company has a strong pipeline of around 19 products, which can start yielding benefits going forward. Though the visibility is low, looking at the promoters and the strong pipeline, we have a strong conviction that the stock should yield excellent returns over a slightly longer time-frame.